Times have been tough for the second line as both Nick Bonino and Higgins have had problems putting the puck in the net. Fans desperately wanted the two apart while the coaches left them attached at the hip as if they were a couple of red-headed Swedish brothers. Bonino seems to have turned the corner a little bit, at least for now, and we’re hoping that Higgins will be next. For example, when taking a look at his last 20 games, we can see that with Higgins on the ice, the Canucks attempted more shots than their opponents 12 times. Additionally, Higgins has had a positive Corsi Rel% in 14 out of the last 20 games. Generally speaking, that says he’s outperformed his own teammates in 70% of those games. Even if Higgins isn’t putting the puck in the net himself, he’s at least doing his part to keep it out of the Canucks net. So far, when playing at 5-on-5, Higgins has only been on the ice for 18 goals against. That’s just one more than first line fixtures Daniel Sedin and Radim Vrbata and two more than Henrik Sedin. 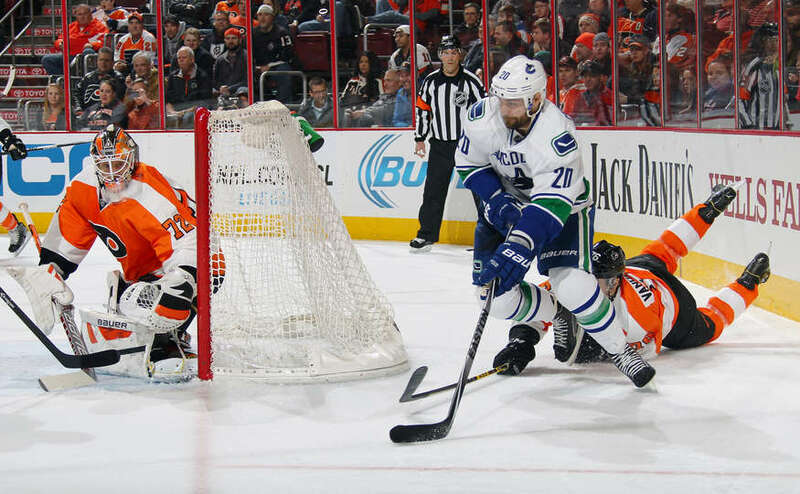 With the 24 goals for that the Canucks have scored with Higgins on the ice at 5-on-5, he’s second on the entire team with an on-ice goals for percentage of 57.1%. Keep in mind that he’s had that success while starting more often in the defensive zones than every other Canucks’ forward except Bonino and playing against some of the other team’s best players on most nights. So, what does this all mean? There is reason to be hopeful that the goals will start coming again in the second half of the season while still controlling the majority of possession. Realistically the Canucks need the second line to be a significant contributor on the scoreboard, even with the four like approach that Desjardins has taken this season.